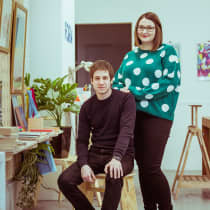 Form Shop was established in 2016 by Joseph Cox and Alice Thomson, a duo who wanted a space which offered goods designed by local creatives with the hopes of giving back to the community. Based on Humber Street, the store is nestled in a community of fellow independents and surrounded by studios and galleries. "As retailers, we need to offer a reason for our customers to come and visit us, whether that's in-store events, talks or workshops, alongside making sure our shop is welcoming and has a unique range of products."